Many years ago there was a merchant who was known for selling the finest pearls to a town of very wealthy residents. Every day, the pearl merchant, as he was known, would purchase these gemstones from an exclusive wholesale merchant he met in his travels 5 years earlier. Pearls, of course, come from mollusks. The best pearls come from either oysters or fresh water mussels. They are considered gemstones and can have great value. 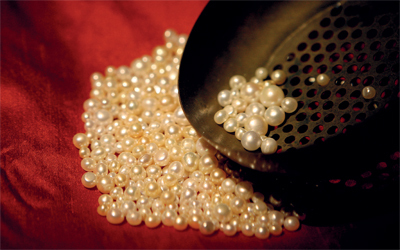 The pearl merchant purchased these fine pearls for $25 apiece and sold them at a profit of $5 apiece. The pearl merchant was making a very nice living but wanted more. He was envious of the extreme wealth many of the town residents had accumulated and wanted some of the riches for himself as soon as possible. Knowing he couldn’t charge more than the market bore, he set out to find another way to profit more on each pearl. One day, he ran into an old acquaintance who traveled town to town, never staying in one spot too long, selling goods from all trades. The pearl merchant told the acquaintance of his dilemma; how he was working hard to profit $5 a piece per pearl, but unable to accumulate the wealth he desired to rival the town residents in the near future. Hearing this dilemma, the acquaintance made him an unexpected offer: ‘I will act as your wholesaler and sell you the pearls for only $10 a pearl enabling you to profit $20 on each one. Showing great enthusiasm, the pearl merchant asked, “How can you sell them at such an inexpensive price when the going rate is more than 2x that? Very quietly, the acquaintance whispered, “these pearls are not from oysters and fresh water mussels and therefore not of the same quality. However, your customers won’t know the difference as they look exactly the same. In no time, you will have acquired the wealth you desire. The pearl merchant couldn’t resist the temptation to accumulate an abundance of wealth fast. So he began to sell the new pearls and his profits grew quickly. Within a year’s time, he was one of the town’s wealthiest residents. Several years later, the pearl merchant, still profiting handsomely, came across a woman who just inherited a great deal of money. She learned of his trade and immediately asked to buy three pearls. After the transaction was complete the woman hurried back to her house to show her visiting brother her new purchase. Her brother, an experienced merchant of fine goods himself, took one look at the pearl and knew it was of the lowest quality. The woman, now angry and full of resentment, immediately set out to spread the word of her experience. Within one week, the pearl merchant lost all his customers and was banished from the town. The merchant tried to take his affairs to other towns, but word had spread there as well and the merchant was no longer able to earn a living. The man learned from this incident what experienced people of the world know very well; that it is best to render more service and value than you are paid; that every transaction remains in one’s memory; that every new transaction alters, according to its nature, their relation to each other; and through the law of infinite returns, the universe will return to you exactly what you deserve..